There’s been much discussion over the inadequate signage for the Lendal Bridge traffic restrictions (aka Lendal Bridge closure). 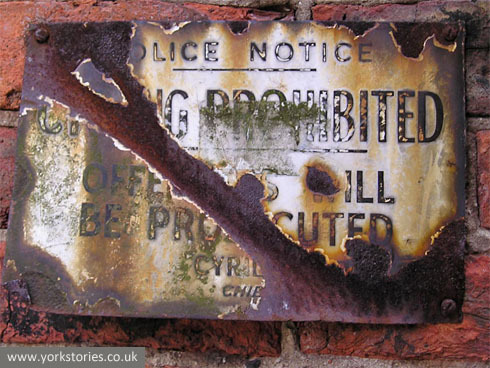 I’ve been reminded of the faded charms of a nearby sign. Pictured back in 2004 (a more recent photo on flickr.com suggests it’s still there) on Lendal Tower, a short stone’s throw from the controversial bridge. It relates to the narrow walkway there by the riverside. They knew how to make effective signs back then. No messing about. CYCLING PROHIBITED. OFFENDERS WILL BE PROSECUTED. The Chief Constable says so. 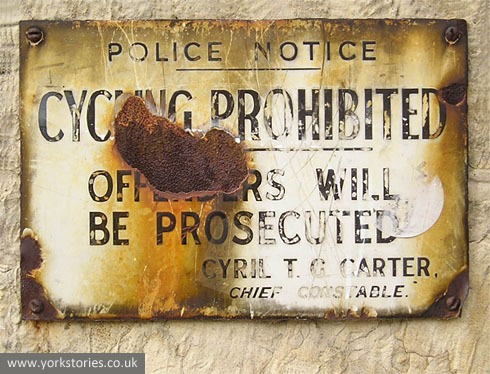 I wonder if anyone was ever PROSECUTED, or if the mere sight of a forbidding sign with words in capital letters was enough to keep law and order back then. Not as well-preserved or as aesthetically pleasing as the other example. Its bottom left corner bent upwards as if someone’s tried to prise it off the wall. If others survive I’d be interested to know. And if you have seen one, cyclists, I would expect you to abide by the Chief Constable’s order and DISMOUNT IMMEDIATELY.